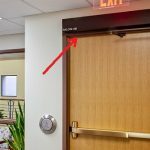 Exit hardware is used on exterior openings, in high occupancy rooms, or anywhere immediate egress is needed. 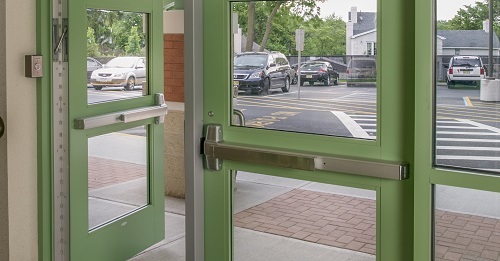 In certain applications, it can be desirable to make a door with exit hardware into a push/pull function, such as in high traffic areas. This allows traffic to flow freely in both directions. Dogging helps accomplish that. In a nutshell, dogging a device holds the latchbolt retracted removing the need to turn the lever or push the panic bar to retract the latch and open the door. You essentially only have to push or pull the door for it to open when the exit hardware is “dogged”. 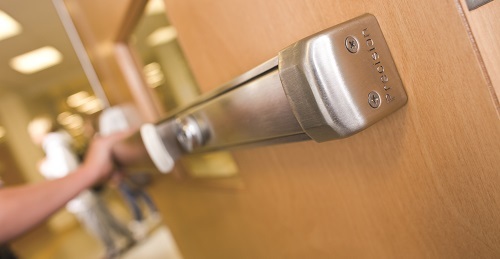 Businesses may have exit devices installed on their entrance doors, but to enable easier use of the doors, they can use dogging to limit the need to manually retract the latch bolt and open the doors. Exit hardware that allows for mechanical dogging means that the latchbolt is held retracted using manual means, such as by use of a hex key or cylinder. When the push bar is pressed in and a key is inserted and turned, there are internal parts that retract and hold the latchbolt retracted. To release the latchbolt the device must be manually released by re-inserting the key and turning to disengage the mechanical dogging. Note: mechanical dogging cannot be used on fire exit hardware. This is due to the requirement that fire exit hardware must be self-latching and remain latched in the event of a fire. 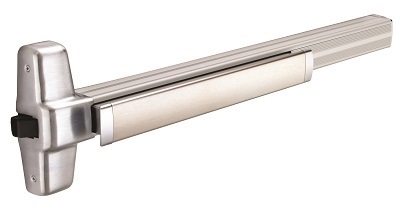 Exit hardware that is electrified can be installed with electrical dogging options. There are a few variations of electrical dogging, but the principle is the same. A motor or solenoid can be remotely activated which retracts the latchbolt and can hold the latchbolt retracted electrically without the use of a hex key or cylinder. This method allows for an access control program to control how long the latchbolt is retracted. A schedule can be set so that, at a shopping mall for example, the entry doors will be set for electric dogging at 7:00 AM when the mall opens for business and then the dogging will be disengaged at 10:00 PM when the shopping mall closes. Note: electrical dogging can be used on fire exit hardware as long as it is tied into the fire alarm system. 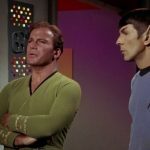 This means that if the fire alarm goes off, a signal is sent to the exit device to deactivate the electrical dogging which allows the latchbolt to re-latch, meeting the self-latching requirement for fire rated openings.